Casa del Popolo was packed last Monday night for a singing, dancing, political good time at Rock ’n’ Roma, a benefit for local Roma families fighting deportation. The evening featured four different Roma music groups, interspersed with first-hand stories from Montreal Roma families. Organized by Solidarity Across Borders, a Montreal-based migrant justice network, and Romanipe, a community organization for Roma people, the benefit raised money and awareness for Roma families struggling to stay in Canada by harnessing music’s unique ability to engage and inspire. Roma people have been immigrating to Canada from Central and Eastern Europe in large numbers, seeking asylum from harsh discrimination, described by Rock ’n’ Roma organizers as “neo-Nazism.” Canada receives more immigrants claiming refugee status from Hungary (a country with a large Roma population) than from any other nation. Roma have a long history of being stereotyped and misrepresented in popular culture, often derogatorily referred to as ‘gypsies,’ and incorrectly portrayed as nomadic. These prejudices have emerged from longstanding oppression of Roma, still prevalent in countries such as Hungary, where discrimination ranges from the violent attacks of right wing extremists, to an everyday bus-rider refusing to sit beside a Roma person. Now, discrimination follows the Roma to Canada, where the federal government has designated Hungary as a “safe” country and is rejecting Roma people’s claims to refugee status. The proceeds from last Monday’s events are going toward legal services and claims applications for Montreal’s Roma asylum seekers. The event itself drew from a broader base than the Montreal Roma community. Hosted by Dafina Savic, founder of Romanipe, and Norman Nawrocki, Montreal artist, Rock ’n’ Roma packed Casa del Popolo with an eclectic mix of Roma families, Montreal activists, and music enthusiasts. While politics was the motivator for the evening, music was its driving force, connecting the array of guests to a rich Roma musical history and to each other through song and dance. Some musicians often have trouble defining ‘Roma music,’ and claim that due to the group’s diaspora, Roma music has adopted other styles depending on the country of settlement. Others insist that despite the diaspora, there remains a distinctive Roma sound. The four acts of Rock ’n’ Roma displayed a continuity indicative of this arguably distinctive traditional sound, such as the use of the accordion, intricately quick chromatic and pentatonic solos, and melismatic (warbling) vocals. But they also incorporated elements that the average listener would not associate with traditional folk music, such as electric guitar or synth, justifying the inclusion of “Rock” in the event’s title and showing that traditional music can be adapted and updated. 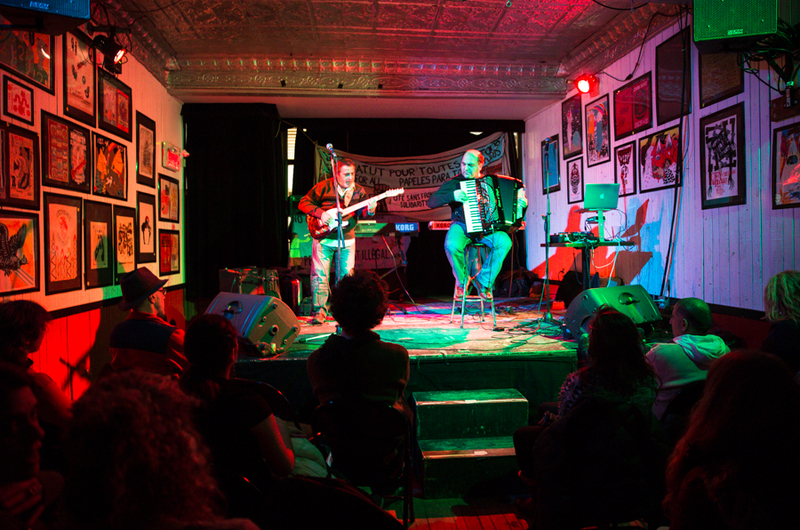 Shukar Roma, the first group to perform, consisted of Sergiu Popa and Dan Armeanca, a Moldovan accordionist and Romaan guitarist, respectively, who met in Montreal. Both virtuosos, their different musical backgrounds and styles of playing – more traditional accordion and jazzier guitar – were perfectly in sync. Popa’s almost frantic accordion playing provided a melody line so fluid that it was impossible to tell when he was improvising, while Armeanca’s electric guitar somehow managed to combine modern jazz, 1960s surf-pop, and centuries-old folk music. The second act featured Boris Bartula on accordion and vocals, accompanied by electric violin. Bartula performed with a much more traditional sound that had the infectious air of a large family or community celebration, quickly turning Casa del Popolo into a dance hall. The last two performances most encapsulated the evolution of Roma music from traditional to modern, as Marijan Zivkovic’s Band explored synthetic accordion and clarinet sounds on their keyboards, and DJ Touski played his set using a laptop. The artists themselves had their own connections to the cause as well, in particular the members of Marijan Zivkovic’s Band, Roma who fled Croatia due to violence and discrimination and are now living in LaSalle without status. Rock ’n’ Roma was the product of different and disparate communities, styles, and histories coming together. The partnership of Romanipe and Solidarity Across Borders, the mixed audience of Roma and activists, and the interplay between traditional and mainstream music created an evening of harmonies. Events such as Rock ’n’ Roma help build the Roma base in Montreal, creating a community of allies and musicians to make the voice of the Roma heard – hopefully loud enough to reach Parliament Hill.